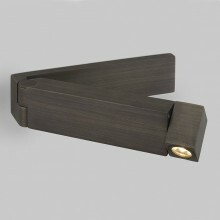 Very contemporary bronze wall light that will add a touch of elegance and a distinctive flair when installed. The design comprises a flexible bronze bracket that extends out from the wall and can be positioned at an angle of your choice. At the end of the bracket is a bronze cube housing a single circular LED that directs the light exactly where you want it. This light includes both an integral switch and an integral LED driver.Ideally suited for bedroom or lounge installation or simply where accent light is subtly required to be positioned.